Dare I mention the ‘C’ word yet, oh go on let me, you know it is there just in front of us, coming up fast, already in the shops and sneaking on to the TV ads – Christmas! There, I’ve said it, it’s officially out in the open for 2013 on my blog at least. As many of you know I am a bit of a Christmas freak, love getting all involved, making prezzies, decorating, entertaining, celebrating, the works. What I like most of all of course is making foodie gifts for family and friends. Well I’d be mad not to when you think I have a larder full of the stuff just waiting to be prettied up and sent on it’s way come Crimbo. Anyway not content with my book So Easy Christmas (available in both hardback and on Kindle) I am now launching a brand new bookette and E Book called Gourmet Gifts For Christmas. 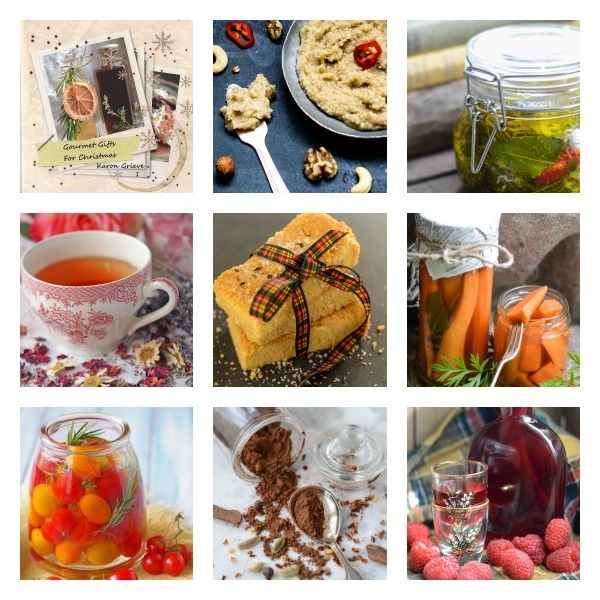 This fabulous little masterpiece contains 26 recipes for everything from my yummy Carrot Cake Jam, Asian Hot Sauce and Orangettes to Brambly Apple Gin, Vin d’Orange and Salt & Pepper Shortbread to name but a few. Fully illustrated throughout, it also has a section on hints and tips for preserving and a page of handy labels for you to copy and use on your own homemade goodies. The Kindle Ebook version has extra information on each recipe (I had more space here!) and also a chapter on packaging too, it also has a link to a page where you can download those labels and tags. As a special promotion the Ebook will be available FREE on Amazon Kindle TODAY Friday 1st November! All I ask is that if you download a free copy today you take a wee minute to give it a review on Amazon. Reviews are all important on Amazon and as this is brand new nobody has seen it to spread the word, so please help out, thanks. It would be so cruel to tell you about this great new bookette and not share a recipe, so here you have something so tasty you will be peeling oranges within the hour! This is a French favourite and there are many ways of making this delightfully refreshing liqueur. I like to use one of the more traditional methods. Peel 2 of the oranges and dry the peel either above a radiator or in a very cool oven. Squeeze out the juice and reserve. Roughly chop the other 2 oranges and put these along with the dried peel and all the juice into a large wide mouthed jar. Strain out the solids, pour back into the jar and add the sugar, vodka and brandy. Strain through muslin into a jug and pour into a pretty bottle or decanter. Serve this orangy delight ice cold and imagine French sunshine in the middle of winter. This is just one of the wonderful and easy recipes in my new bookette Gourmet Gifts For Christmas and I’m sure you’ll just love all the others in there. I will definitely leave you a review on Amazon but I wanted to leave one here as well! I LOVE the book…it’s full of recipes that people would actually LOVE to make and receive! You did yourself proud Karon, this one is my personal favorite – until your next one I suppose! So glad you like the book, I loved making it. Thanks for the great review. One more thing…I did leave a review on Amazon, said it might take up to 48 hours to post – what’s with that?!? And I shared it on FB…I truly do love your book – and I know my friends will love it, too!